And don't forget to search this ebook store for "Wildside Megapack" (or just Megapack if Wildside Megapack doesn't work) to see all the entries in the Megapack series -- including volumes of science fiction, fantasy, horror, mystery, westerns, and much, much more! Armageddon -- 2419 A. D.
Thoroughly loved these from start to finish. A few good short stories. Some interesting. A lot of apocalyptic themes and space exploration themes. 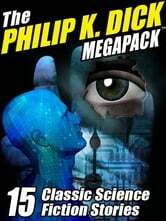 All the best of Philip K Dicks short and amazing stories in one place, a must for all fans. Loved it from start to finish, from one page to the next.